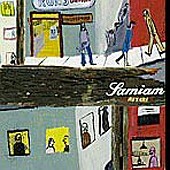 Samiam are in full force on their latest, Astray, a potent mixture of punk and pop. So strong, you'll instantly be hooked, but powerful enough to keep you coming back. The songs are sugary on the first bite, but completely filling on each additional bite. You'll come, but you won't want to leave as they take you down a long road of tight, punchy, hard-hitting punk music that has just the right amount of pop. I'll give it a B.